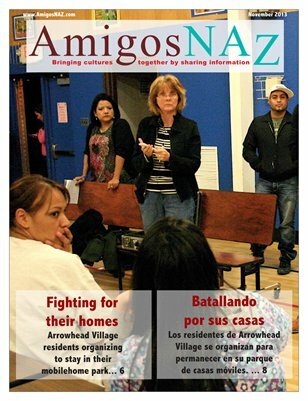 The November 2013 bilingual edition of AmigosNAZ opens with a cover story on a protest by residents of the Arrowhead Village trailer park in Flagstaff to plans by a Georgia developer to turn the property into multistory student housing. The edition also includes an update on the Nov. 5 election which includes a measure to raise property taxes to support Coconino Community College; a commentary on the fight for ethnic studies in Arizona, a community commentary supporting residents of Arrowhead Village; a travel story by Stacey Wittig on the charms of Rancho de Chimayó in New Mexico; a preview of slideshows of recent events on www.AmigosNAZ.com; tips on how to use diet to supplement your workout routine; ideas on how to get a home organized this fall; options to consider before buying auto insurance; and tips on figuring out how much turkey you need to by this holiday season. All this and more brought to you by AmigosNAZ — Providing information for and about the vibrant Latino community in Northern Arizona.